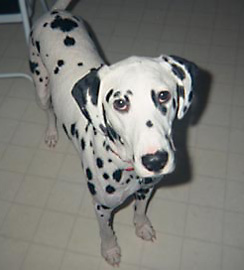 Deaf dog: George, a Dalmatian deaf from birth. Other pets: cats Chico and Marisa. 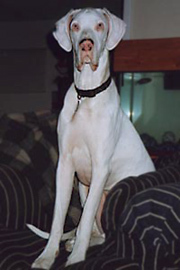 Deaf dog: Solomon, a two and a half year old Harlequin Great Dane. Other pets: Midnight, a female Black Lab/Boxer mix; Newt, a lovable female mutt. Deaf dogs: Mork, a 12 year old Dalmatian. Mork is a very gentle and compassionate dog. He is extremely intelligent and obedient. He lays in the front yard without a leash and watches people and other animals go by without barking or giving chase. 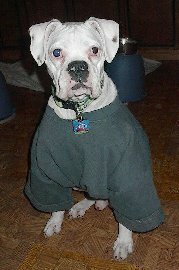 Other pets: Hooch, a 2 year old white Boxer. Mork loves to clean his ears and eyes for him. 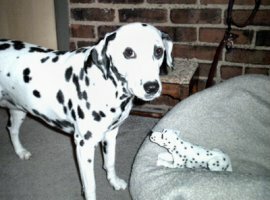 Deaf dog: Anniesullivan is a 6-year-old Dalmatian. Everyone Annie meets immediately falls in love with her. She is calm, yet fun and very, very loveable. Her Mom says: "Someone bought her from a breeder knowing she was deaf and ended up giving her up. She spent the first year of her life in 5 different foster homes before coming to me. She has been the perfect dog. She's wonderful with all people and especially patient with kids. I wouldn't hesitate to get another deaf dog after having her! She does great with signs and always keeps an eye (or paw) on me. We went through some trouble at first with separation anxiety, but once she realized I was always coming back to her a night, she learned to trust me and calm down. I feel blessed to have her." 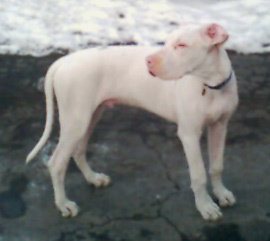 Deaf dog: Pinkerton is a 7 month old Great Dane. His family says "We adopted him thru a Dane Rescue here in Ohio when he was 12 weeks old. In one week he learned the signs and expressions for "NO," "Good Boy," "Down," and to my surprise "GIVE ME PAW." He's been ace-ing the Give me Paw sign all day today. I'm really impressed with how fast he is learning everything we're trying to teach him. The lady at the Rescue Kris did a great job of socializing him after she rescued him and his two deaf brothers from a local breeder who was keeping him penned up and unsocialized. We have a hearing 5 year old Ithica Hound dog who is a great help when trying to get Pinkerton to come back in the house when called. We're even teaching the hound dog (Chase) to learn the hand signs so everyone's on the same track. I'm amazed at how fast Pinkerton is learning . Of course it's tough to get his attention when he's having a stupid puppy spell unless you actually touch him to get his attention. We brought Pinkerton into our lives after losing our ten year old Great Dane back in October. He's sure helped to fill the giant hole in our hearts from loosing our Coda Dane. Other pets: Chase the hound dog and quite a few kitties. Deaf dog: Annie is a 4 month old Aussie Mix. Her mom says "I have just recently adopted Annie from a rescue organization. I saw here picture on their web page and fell in love. I have had here only a few weeks, so I am learning hand signs and communication. She seems very smart and a true lover. She was scared when we first got home, but I think she is adjusting well. I am going to sign her up for puppy class and then basic obedience. Annie is my first deaf dog." 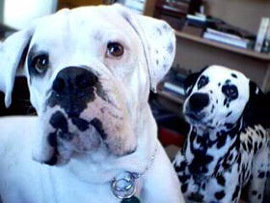 Deaf dog: Dempsey was adopted when he was just a pup, and has since become a regular foster brother for many homeless boxers. He has earned his Canine Good Citizen award, and is training to be a Pet Therapy dog! Marci came to us first as a foster, but she decided to become Dempsey's permanent sister! She is small but full of energy, eager to learn and play! She has learned a lot of tricks from her older brother, and will be attempting to earn her CGC this year some time. Other pets: Rudy, an 8-yr old cat. Deaf dog: Remington's human pal writes:"Remington suffered so many ear infections from birth that his left ear cannal was removed and his other ear is constantly infected!! He can only hear very loud sounds"
Deaf dog: Gibson is a 3 year old Boxer. "Gibson is a rescued Boxer and a great guy! He is also blind in one eye which wasn't discovered until about a month after he came to live here. He's a typical Boxer pup and nothing slows him down!!" Other pets: 2 fawn Boxers, 1 white Boxer, 1 Bassett Hound, a mutt, a rabbit, 3 hamsters and a bearded dragon. 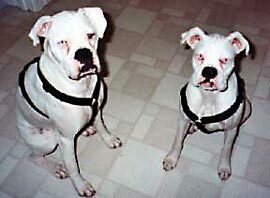 Deaf dog: Plymouth is a 1-1/2 year old white Boxer. "Plymouth is a gorgeous white male boxer with beautiful brown eyes. He is very muscular and loves to run. He has some light brown spots all over his body - call them beauty marks and one slightly over his eye accenting his brown eyes. He loves to play with his boxer brother and sister who are his hearing buddies. He is a wonderful pet who was rescued from a "kill shelter". He has added so much joy to our lives I can't remember what life was like with out him." Human companions: Annette Stone, Nicholas and Matthew 0twin sons.